Life is full of decisions, and every decision we make has an echo that affects our future. 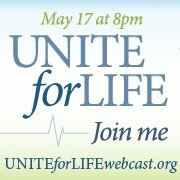 On May 17th at 8:00 PM local time (9pm in the Maritimes), come be a part of the UNITEforLIFE webcast with Abby Johnson, a former abortion clinic director for Planned Parenthood. Join us for heartfelt discussions as Abby shares her long-held desire to help women in crisis, and the moment of pure awakening that led her to re-evaluate her life’s work. Please go to Uniteforlifewebcast.org. Starting Friday, May 13, 2011 and continuing through Tuesday, May 17, 2011 (the day of the webcast) use this graphic as your profile image to show you’re support for the event with other pro-lifers on Facebook. Just right click on the image and choose “Save Picture as” and save the image to your computer. Then, on Facebook, select this image as your profile pic. Just right-click on the image, choose "save picture as" and save to your computer. Then, on Facebook, select this image as your profile pic. It only takes a little time to get involved and spread the word. Would you please pass this information along? And more than anything else... please pray for the event and all those attending.